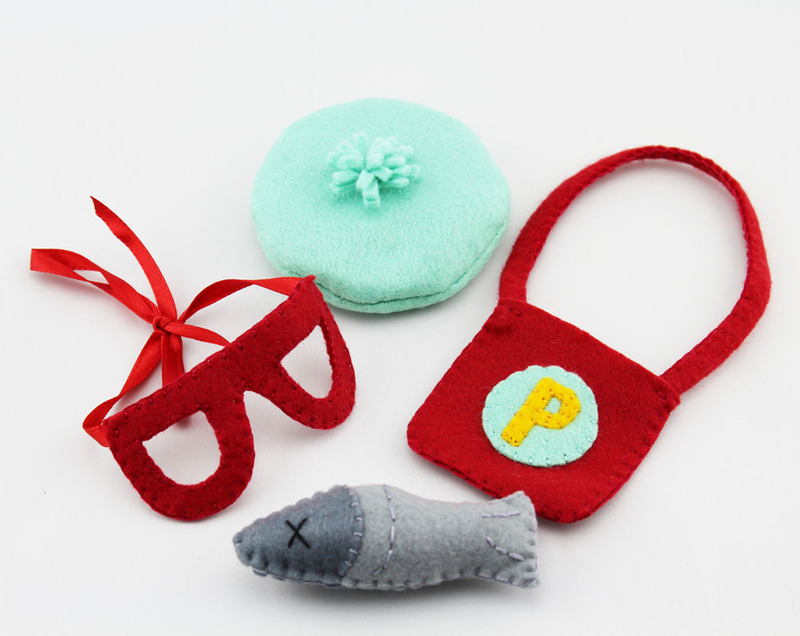 The Sassy Pack Rat: Everday Accessories Felt PDF Pattern Set Is Finished, And I'm Having A Sale! Everday Accessories Felt PDF Pattern Set Is Finished, And I'm Having A Sale! Whew! 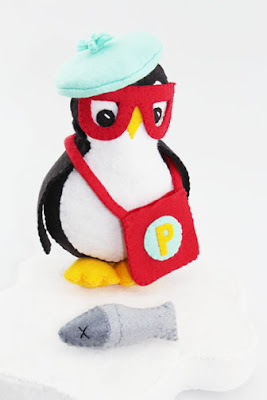 I did it, I finally finished the Penguin plush felt add on accessory patterns! I ran into a lot of technical computer issues and I'm not gonna lie, there were some banging my head into a wall moments. But it's done and the relief I feel is amazing! I am so very proud of these patterns. They are like my 2nd set of children, well maybe my 3rd set cause my dogs are my 2nd set. I don't usually blog on Mondays, but I was much too excited to wait until Wednesday and this pattern deserves it's own post. I've named this pattern set Everyday Accessories. It contains 4 patterns to make a fish dinner for the penguin, a satchel to carry the fish, a jaunty little beret and removable glasses. There are also instructions for making glasses that aren't removable. Here's the felt Penguin plush wearing the accessories. Isn't this just the cutest? 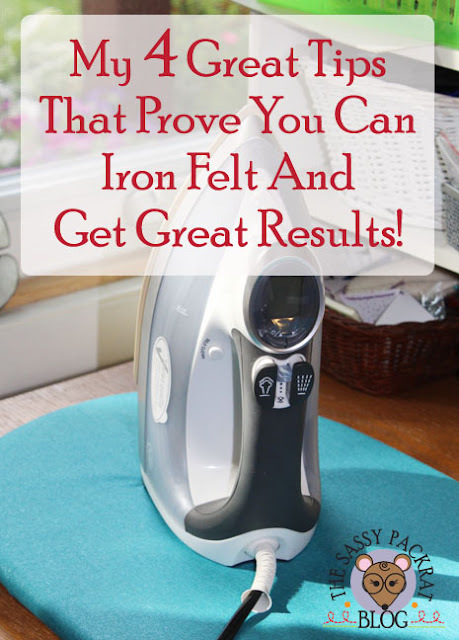 The listing is now in my shop and these patterns are easy to make. I've written step by step instructions with photos to explain the whole process. I also made another listing of both the penguin and the accessories together. I made a bundle of the 2 sets of patterns that you can buy together for a lower price than if you bought them separately. I'm just so giddy about these patterns! I hope you all like them half as much as I do! 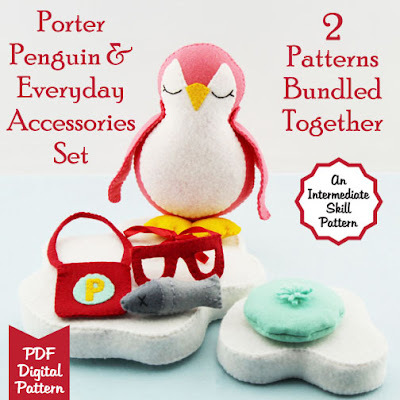 This bundled pattern set of both the penguin and the accessories can be found here. I'm so excited that I decided to have a pattern sale! 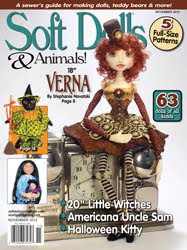 Head on over to my website and use this awesome coupon code, PATTERNSALE20, for great 20% OFF savings! I also added links to all my patterns in the blog side bar. Now I'm off to make another pattern!